A 600PS sedan does not sound like an alien concept anymore, thanks to manufacturers pushing performance envelopes further and further. 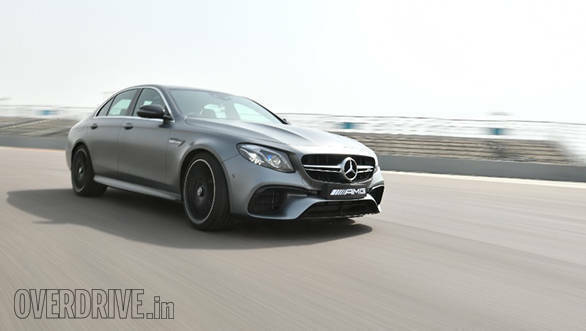 And the newest member of the 600PS saloon club is one of the most hallowed names in the world of performance luxury sedans, the Mercedes-AMG E 63 S. Well, that isn't the only big news from under the new generation E 63 S AMG's skin as for the first time in its history, the car moves from a coil spring suspension setup to an adaptive air suspension setup. More importantly, the new E 63 S moves from a single driven axle to two and gets permanent all-wheel drive as standard. Hold your horses  that doesn't mean it won't let you hang that tail out. It now features a 'drift mode' that will send all 612 ponies to the rear wheels and turn the car into a drift machine until you switch drift mode manually! We got a little taste of the car at the Buddh International Circuit, though there sideways action wasn't on the menu for the day. The short session has tantalized our taste buds big time, leaving us wanting for more. The 2018 Mercedes-AMG E63 S replaces the E 63 AMG as it was known and is the performance version of one of the best-selling luxury sedans in the world, the Mercedes-Benz E-Class. 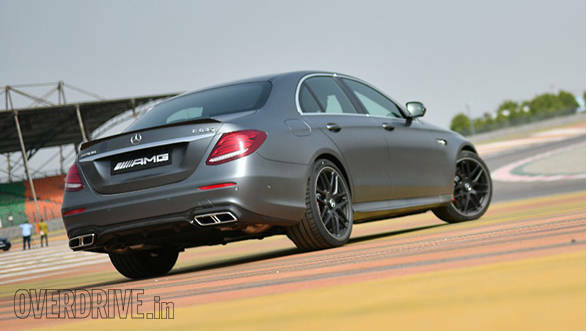 While Mercedes-Benz only sells the long wheelbase version of the E-Class in India, the E 63 S has a shorter wheelbase that is identical to the standard E-Class sedan sold internationally. 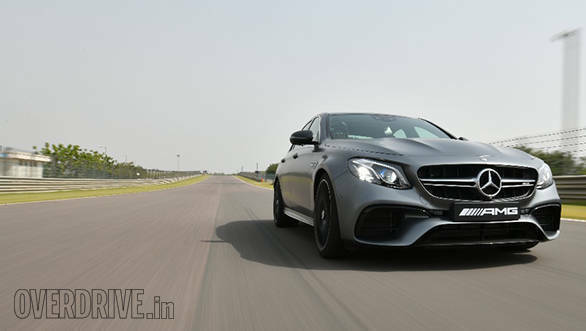 That said, there's lots of design changes at both ends to ensure your beloved, fire-breathing E 63 S AMG won't be mistaken for the relatively humble E-Class diesel that's the best-selling midsize luxury sedan in India. The front end looks a lot angrier thanks to the more muscular hood, while the front bumper features a more aerodynamic design. The E 63 S uses a single slat grille that houses the three-pointed star as well, while the headlamp units integrate blue lights that add to the uniqueness of the front. Move the rear and there's no way you can mistake the E 63 S for an E-Class, particularly thanks to the little carbon fibre spoiler on the bootlid, the carbon fibre splitter at the bottom as also the chrome-finished quad exhausts that are housed in carbon fibre surrounds. It's a backside you can ogle at, and I have to admit, the E 63 S looks the most stunning wearing the matte grey paint job you see on the car here. The E 63 S AMG runs on 20-inch alloy wheels shod with massive 265/35 R20 tyres at the front and even bigger 295/30 R20 rubber at the rear to offer optimum grip at all times. The calipers for the carbon ceramic brakes (not part of standard equipment) are finished in golden and add to the appearance of the matte finished alloy wheels. Step inside you're greeted by acres of carbon fibre all round, particularly the central rib of the dashboard as also the centre console. It's a different world here, especially once you're in the snug-fitting single-piece AMG seats that are very comfortable to be in. 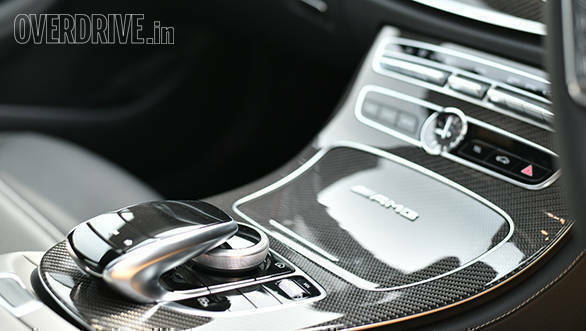 The driver's seat is fully adjustable and so is the steering wheel, but on the whole you sit lower in the E 63 S as compared to the E-Class for a sportier, low slung feel. The steering wheel is a delicious looking, flat-bottomed unit clad in expensive suede leather and also holds the brushed-aluminium paddle shifters. Most of the controls are identical to the E-Class including the track/touchpad on the steering wheel as also the ones for the COMAND system. The instrument cluster is a massive, high-resolution screen that appears like an extension of the large display for the instrument cluster. The E 63 S also gets a HUD for the tachometer and speedometer, which looks minimal but sporty when behind the wheel. 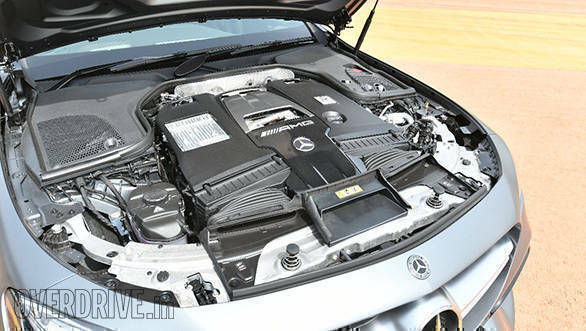 The 2018 Mercedes-AMG E 63 S 4MATIC+ is powered by the same, 4.0-litre biturbo V8 engine that powers the AMG flagship car, the GT R. In this guise the engine offers a staggering 612PS and a stomach churning 850Nm  that's 150Nm more than the GT R itself! Still not stunned? How about the fact that the claimed 0 to 100kmph time for the E 63 S is 3.4 seconds as compared to the GT R's time of 3.6 seconds? That's nuts for a four-door saloon! The twin turbochargers are nestled between the cylinder banks of the Vee to minimize turbo lag and for the eco-friendly lot, cylinder deactivation has been integrated into the powertrain as well. 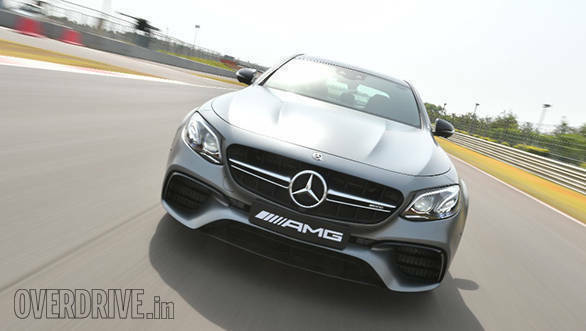 The engine is mated to AMG's 9-speed Speedshift dual clutch transmission. The list of driving modes includes Race mode apart from Eco, Comfort, Sport and Sport+. Race mode limits intervention from the traction control system to let you have the rear wheels step out though it doesn't the system off completely. You have a separate button to turn TC off entirely, though activating drift mode is a fairly complex procedure we're told, to ensure it isn't selected at the touch of the button  a rear wheel drive, 612PS car with no traction control sounds like a surefire recipe for trouble, doesn't it? Well, to give you another perspective about the car's brutal performance, let me tell you, the Lamborghini Huracan's naturally aspirated V10 engine offers 2PS lesser than the E 63 S at 610PS! 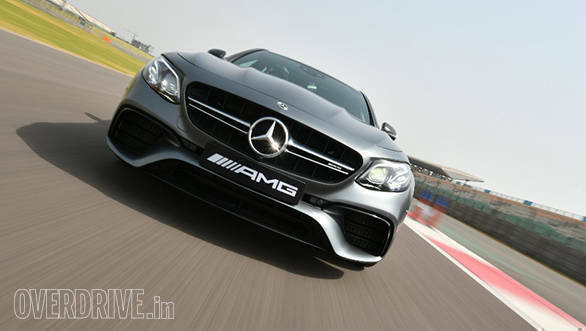 Oh, and this is an AMG, so the acoustics are head-turning, smile-inducing and all that. Well, with forced induction, the new generation AMGs don't sound like the almighty clearing his throat anymore, but yeah, this E 63 S does sing an awesome soundtrack through its chrome-finished quad exhausts. To be honest, a few minutes and a couple of laps in a car offering over 600PS is barely a gauge, but the experience did give me a taste of the car's demeanor. Drive it at part throttle and the car is more than willing to let you feel as comfortable as the E-Class itself  dial the performance down via driving modes and the throttle response is smooth. But stomping on the loud pedal in any mode ensures the action of you being thrust into the seatback is only preceded by a quick downshift from the gearbox and an angry roar from the exhausts as revs are matched for the lower gear. Performance is mind numbing to say the least and you have to respect each one of the 612 ponies under the hood even on a racetrack, lest you want to end up in the gravel trap. There was a bit of a jiggle every time I buried the throttle into the floor at corner exits in Sport+ mode, but the electronics worked well to rein it in. Explicit instructions from the AMG instructors meant we did not touch the ESP off button or try Race mode and admittedly, I was happier harnessing all the power endowed by the mighty V8 in Sport+ itself. This also helped me focus on other aspects of the car, like the slightly heavy feel around corners. Grip levels offered by the tyres are massive throughout turns though which adds to confidence levels. The steering on the E 63 S feels a lot more feedback-y than the last generation E 63 AMG (I drove it at the BIC itself) and turn ins were accompanied by a precise feel, with just the right amount of weightage dialed in. Bumpier sections of the track also helped me realise that Sport+ mode had the 20-inch, low profile tyres make the experience noisy over bumps, though a lot of it was ironed out in Comfort. It should be interesting to see how the car feels on our roads though with the air suspension. I also noticed that despite the relatively shorter wheelbase the E 63 S offers ample space at the back, which, like its predecessors should help in adding to its credentials as a family car. The Mercedes-Benz E 63 AMG as it was known earlier needs no introduction to the enthusiast and is in fact worshipped at the performance car altar for its beastly performance, roaring exhaust note and sporty handling as much as it is revered for its comfort and luxury. 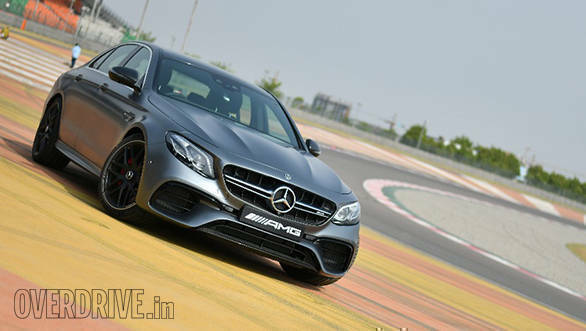 The new generation E 63 S? Well, it just tries to take that game a notch higher. The car is in fact the most powerful E-Class ever, which is quite a statement to make for what is one of the most popular luxury cars in the world. The improved performance levels in fact bring the E 63 S closer to supercars than it ever was. Consider the starting price tag of Rs 1.50 crore ex-showroom (there's a range of customization options on offer) and you'll really scratch your head wondering if you ever need to buy a sportscar. The E 63 S has only one immediate rival, which is the BMW M5. The all-new M5 was launched recently at the 2018 Auto Expo and the rivalry has clearly been rekindled, afresh. Time for that epic rematch then!